wheat free | eating with S.O.L.E. Yum! Tonight I whipped up the most fabulous peanut-y satay sauce and it was the perfect addition to some quinoa, tofu, veggie bowls. I wish I had thought to make a cold peanut satay style sauce before now! This stuff is fabulous, I will certainly make this again and again. It’s a funny time of year hear… we are excited about growing and have greens started and sprouting all around us, we are prepping beds for the upcoming season, and have been finding food all over, in tiny amounts. 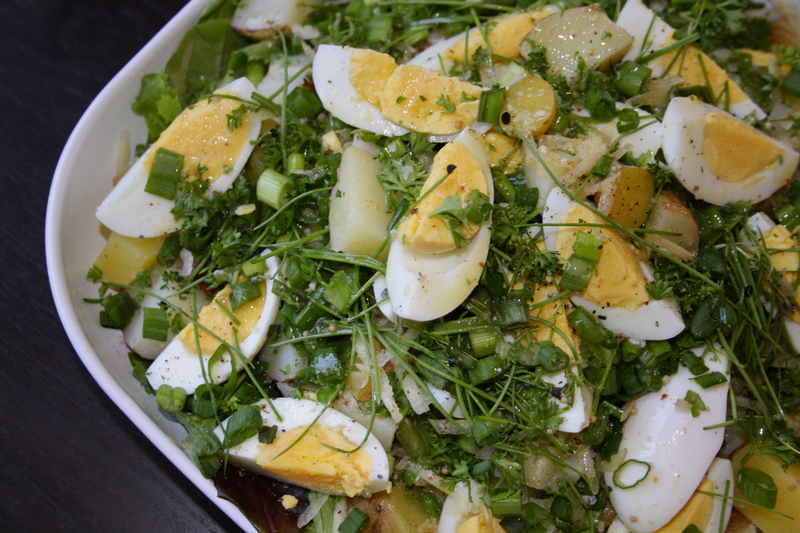 This lovely egg and potato salad features all sorts of spring time finds; eggs scavenged from the hen house, potatoes found in the soil along side yellow carrots, the tiny snipped tips of wee onions starts, chives and micro greens all delicately clipped from the window seed starting racks. This found salad was then slathered with a vinaigrette that used up the last of my homemade grainy mustard. A true Easter weekend egg hunt done right! I just spent the last couple weeks back in the prairies taking some farming classes and meeting with farmers and chefs alike, it was really nice to see just how connected some pockets of the culinary world are becoming… farm 2 fork is contagious and it’s about time it start catching on! My sweetie helped me name this soup, as I have no personal memories of Thailand or Vietnam, I do have a pretty clear memory of seeing Glass Tiger play a concert at Calaway Park as a kid , thankfully the delishiousness of this asian inspired soup is not in anyway connected to the bands performance (only in reference to the glass noodles), and in fact I think this soup rocks harder than Glass Tiger ever did! 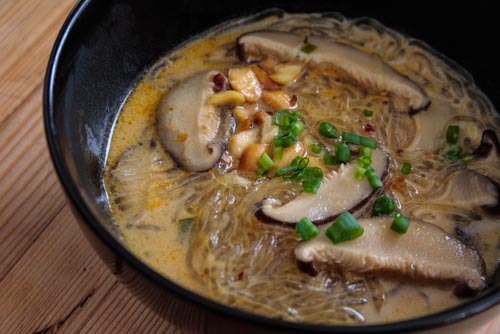 The other big plus is this soup recipe is offering some reprieve from the never ending request for hot and sour soup… finally a substitute. More about hot and sour soup drama here. This soup is silky and sweet, sour and creamy with some good hot undertones. A great vegan (or non vegan) bowl of goodness, depending on your supply of old roosters; My batch today was made with rooster stock (from our meanie bird who just departed the barnyard cast this past weekend, he was only good for dog food and soup stock, as he was lean and tough and did I say mean?) BUT of course you can you veggie stock to make it none meaty no problem! The other night we hosted a number of friends and stoked up the big ‘ol outdoor turkey deep fryer which kept the folks entertained and well fed with an array of fried fare, and debauchery. At one point (with the first basket of french fries) I thought our band new outdoor shower might have gone up in flames, thankfully it was just a river of boiling oil next to a rocking open flame bubbling around my flip flop feet! Yikes! You can be sure if the deep fryer comes out (which happens about once a year) some comedy ensues. We fried up: 2 whole chickens (1 from our stock and 1 my dear friend raised to it’s full on 7.5 lb fulness), 7 kokanee lake fresh fish the boys caught the day before they were fried whole until crunchy and perfect, dozens of veggie pakoras and a mountain of fries. Good thing I advised everyone to bring healthy leafy veggies and nothing fatty to accompony this fry up! My girlfriend for the first time in her life showed up at the party with a raw, thawed bird as her pot luck item! PERFECT! It was a great night, and in the end most everything was consumed, except the last chicken “Jayne Mansfield”, We had about 2/3 of her left and I felt she deserved the guest of honor place on the dinner table the next day so I whipped up this citrus mustard maple dish to soak her in and served her on a mountain of fresh arugula that another friend brought a pillow case sized bag full of! This was a great way to serve left over chicken, but I think it would be perfect with tofu or white beans in place of the chicken. 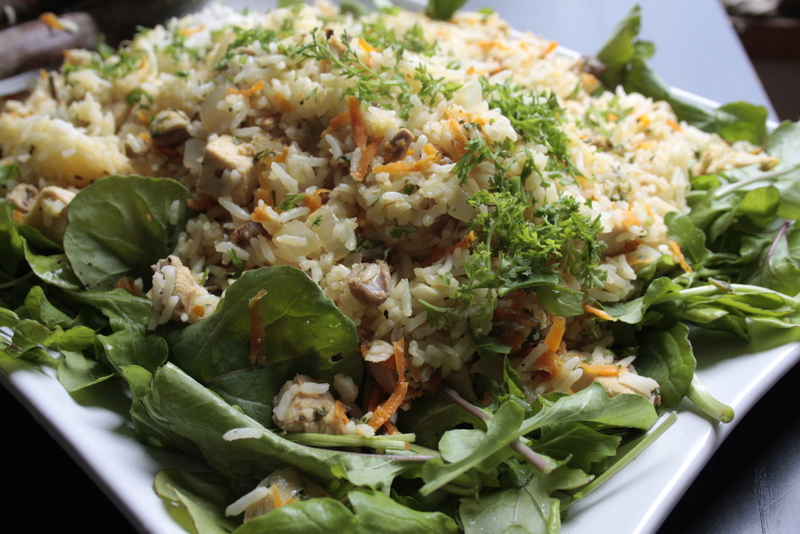 The nice thing about this dish is the hot rice blend was served over the fresh and unseasoned aruluga which wilted just a little and added such a nice fresh peppery crunch to the meal. Cook 2-3 cups of rice using your favorite method. Simmer away in the sauce for 5-10 minutes. Garnish with fresh chopped crest and rosemary, a squeeze of lime and a little sprinkle of sea salt. 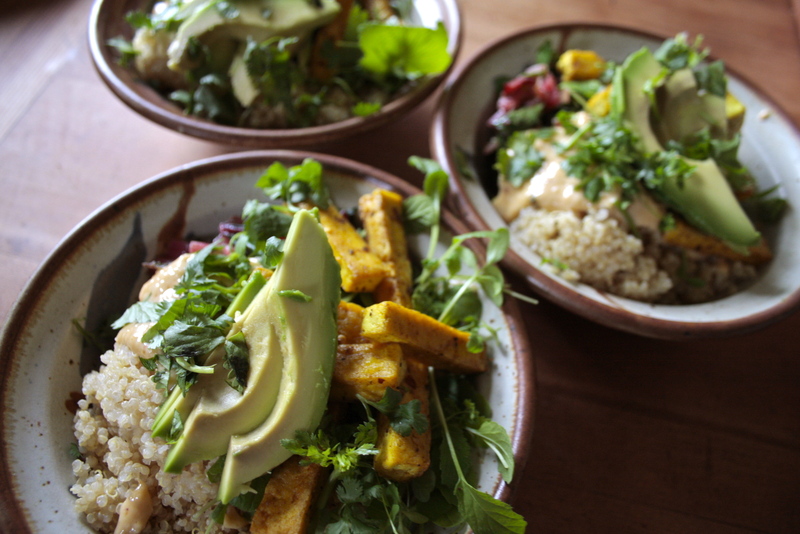 One of the things I miss most about city living is the delicious ethic food abundance! Back in my hometown of Calgary I miss Namskar my favorite Indian place, and Rea’s for Italian from scratch and the great service, Golden Bell for Pho, Borak for Turkish, and just about everywhere and anywhere in New York city for a slice of pizza pie or a bagel with a schmeer! Out here in the bush I have to settled for home made ethnic everything shy of a very few mediocre Mexican / Japanese and Indian places all at least an hour from me! Some days I could kill for some veggie sauté soup and a bean curd springroll! 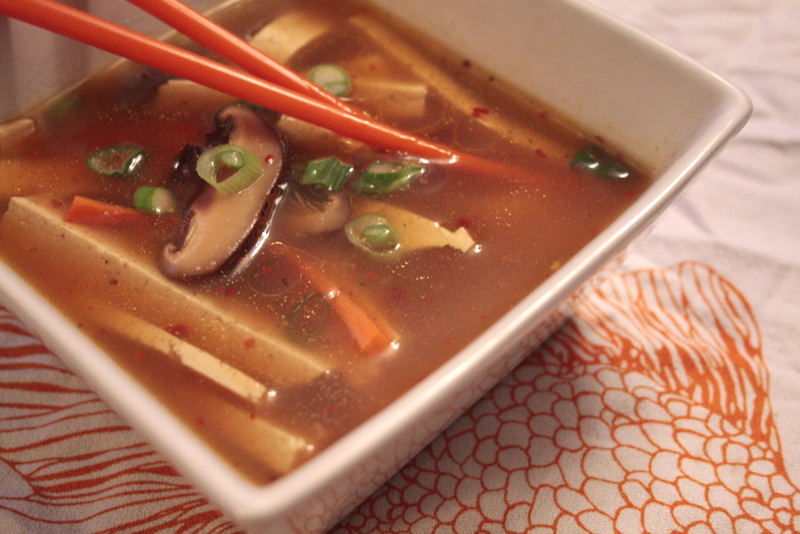 I just checked one of my readers blog voguevegatarian.com and was thrilled to find a hot and sour vegan soup recipe! Yumm, my mind was set on trying out her recipe at once. I have since made it twice, the first time I made the big mistake of subbing Braggs for light Soya sauce, and while my sweetie LOVED it and ate the whole pot.. it lacked authenticity for me… my mistake. Anyway’s this evening I took a crack at it again, and netting quiet possibly the best hot and sour soup I have ever had… well except for the soup on sizzling rice versions which I adore and miss dearly. 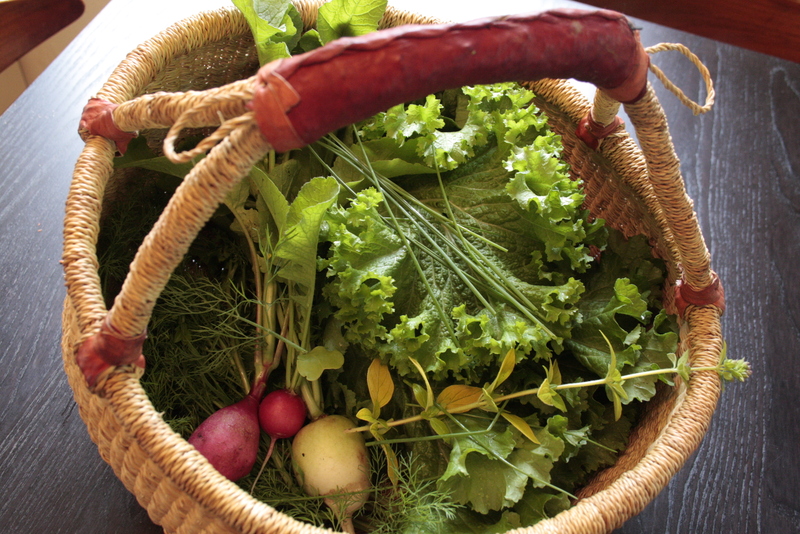 There are so many greens and shoots and edible flowers popping up these days from the garden! My salad bar is back and it is fabulous! The other evening we enjoyed a pot luck at a friends house up the river, I brought this garden salad with a really nice hemp kiwi dressing, but far more impressive than anything we ate was the show we got to enjoy: a fire dance accompanied by a chello along with a thundering lively lighting show, while sitting around the camp fire with our fabulous brew co-op wine in hand! I have been spending lots of time in the garden and on the lake these days, and although I am making lots of lovely meals for our revoloving door of guests I haven’t been taking the time to write about them all… so I am starting the process of going through images of meals past to reveal some recipes and do some posting, in all my free time! 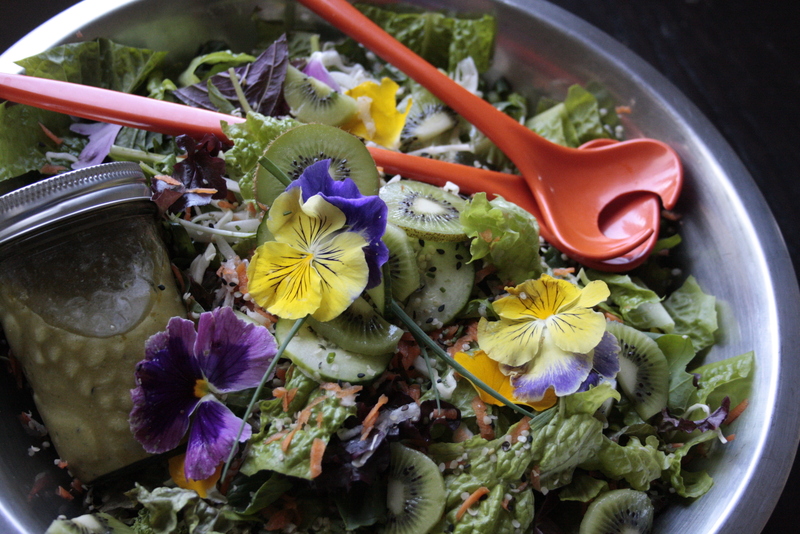 This salad was simple any green assortment I pulled from the garden along with some thin cucumber slices, kiwi slices, shaved cabbage, edibale flowers and a handful of hemp seeds. and about 3 tbsp black sesame seeds. toss before serving and enjoy! * the picture below is my evening dinner collections complete with the first lovely easter egg radishes that don;t have much chance to get to the table between me and my daughter and our snacking.